Standard carton flow systems consist of two main components: framework (Vertical frames, Shelf Frames, Sway Braces) and roller tracks. Keneco offers multiple options with each of these components to create a carton flow system that works best for you. Keneco carton flow rack is cost effective and versatile. Choose between straight or knuckled shelves and layback or no layback vertical frames, for a system designed to specifically meet your needs. No other type of flow rack gives you as many design options. Our ergonomic designs can be used as stand alone systems, with conveyors or installed in pallet rack. Keneco carton flow works great for full case or split case applications with either cardboard cartons or plastic totes. 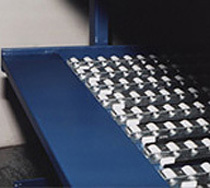 Roller tracks can be adjusted to accommodate various size cartons, or tracks can be installed on close centers so that all box widths can be used on the same shelf without “profiling” the lanes. Choose between welded or K/D (knocked down) shelves. Welded construction arrives already assembled for quick installation, while k/d shelves ship on pallets for easy handling and reduced shipping costs. 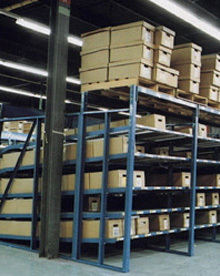 K/D shelves can be installed around existing building columns. 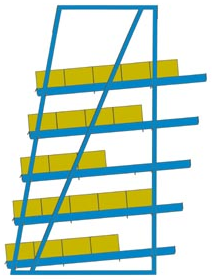 Keneco is unique in the industry for offering all carton flow rack types. Whether you’re looking for custom or standard carton flow, or to convert your pallet racks to carton flow, you will find it here. 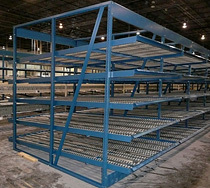 Keneco offers a variety of shelf frames for your new or existing flow rack systems. Shelf frames can be easily installed in pallet rack uprights. 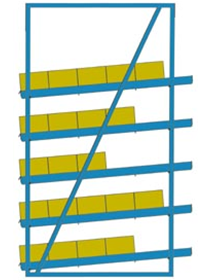 Keneco offers you the choice between welded or k/d (knockdown) shelf frame construction. 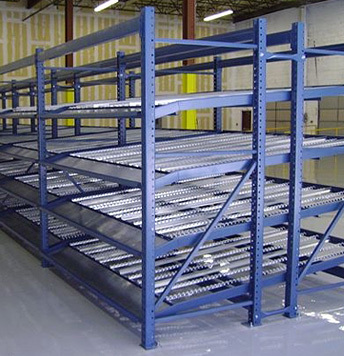 Knockdown shelves are shipped on a pallet for easy handling and reduced shipping costs. They also have the added convenience of being able to be assembled around building columns. Welded shelf frames are heavy duty and arrive already assembled for quick installation. 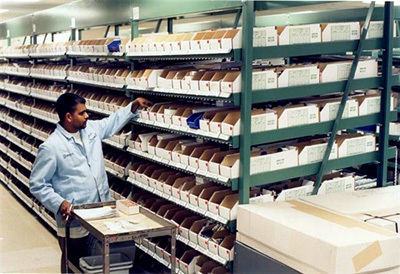 Offering the densest use of available space, straight shelves are typically used for full case picking. Impact Trays protect Track and Guide while loading heavier items. Knuckled shelves allow for easy access into cartons for split case picking. 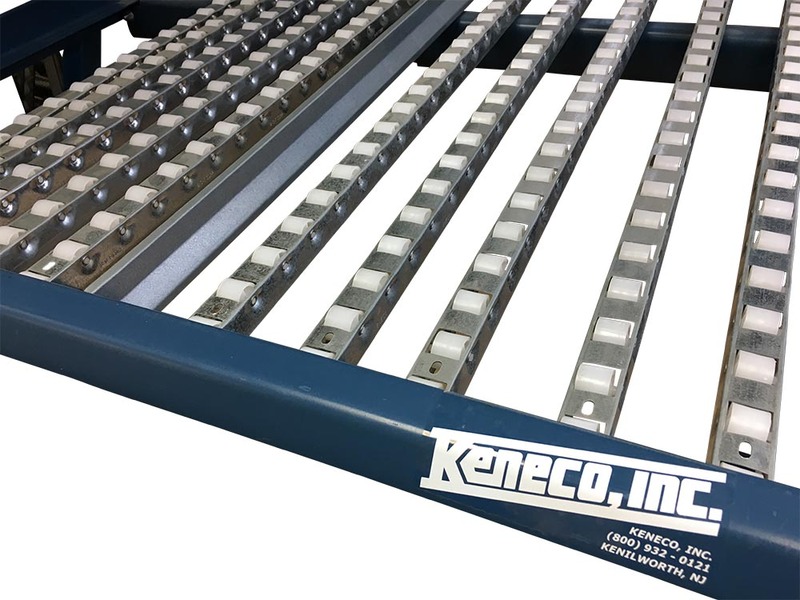 The most cost effective way to turn pallet rack into carton flow is with a Keneco gravity flow rack solution. 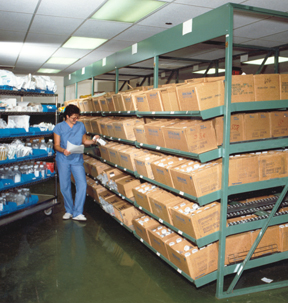 Keneco shelf frames can be installed in any pallet rack for efficient full or split case picking. Use roller tracks and guides to create individual lanes or install tracks on 3” centers to create a bed of rollers. Featuring vertical frames of welded construction, Keneco carton flow racks are available in two configurations to meet a full range of application requirements: layback and no layback. Slotted posts speed installation and shelf adjustment. 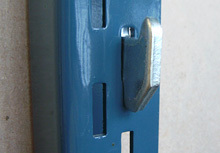 Shelf clips allow quick adjustment on 3/4" increments. No layback configurations are best suited for full case picking and offer the densest use of floor space. Layback configurations allow for easy access into cartons for split case picking. Typically this requires an additional 1 ft. of floor space.